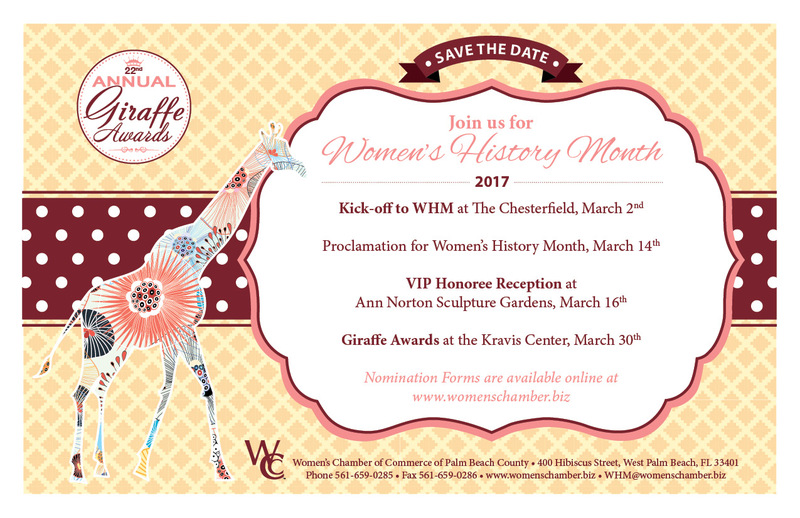 Join us as we celebrate Women’s History Month during our month-long series of events culminating with our Annual Giraffe Awards. Don’t miss this opportunity to connect with prestigious event attendees, Giraffe Award nominees, and other community leaders while increasing your business visibility. The times for our public Kick-Off Networking Event and invitation-only VIP Reception are 5:30 p.m. to 7:30 p.m. The Women’s History Month Proclamation will take place in the Commission Chambers on March 14 at 9:00 a.m. in the Robert Weisman Governmental Center, 6th Floor, 301 N Olive Avenue. The Giraffe Awards Luncheon at the Kravis Center includes a vendor expo and will take place between 11:00 a.m. and 2:00 p.m. We look forward to your participation. Want to be a Giraffe sponsor? You’ll enjoy entry to all Giraffe events including our Kick-Off Event at the historic Chesterfield Palm Beach, our invitation-only VIP Reception at Ann Norton Sculpture Gardens, and the Giraffe Awards Luncheon at the Kravis Center. Sponsorships begin at $195. These sought-after sponsorship opportunities are purposely limited to ensure the greatest impact for you and your business. Your sponsorship helps bring needed resources to support meaningful programming, business advocacy, and training for women at all stages of their working lives. Download the sponsorship form here.